With thousands on thousands of different paper stocks available paper selection can often seem daunting. Often simply selecting the most expensive option will not ensure the best result for the job in hand – would you use a thick glossy luxurious paper stock for a charity flyer? Probably not, it conveys the wrong message – ‘why bother they have enough money already’. There are two main things to consider when selecting paper stocks for different print jobs, both of which will have an effect on how both the printed item and your brand will be perceived. Paper density refers to the thickness of the paper and is measured in GSM (grams per square meter). The higher the GSM the thicker the paper. Likely to be handed around and thumbed, comp slips should use a more durable stock than ‘standard printer paper’. 120gsm stocks are more durable than typical standard 80gsm papers and convey a message of quality. Slightly heavier than standard 80gsm printer paper, 120gsm conveys quality without being too heavy. 120gsm will also easily run through all office printers be they injet or laser. Perhaps your most important piece of print, business cards should be printed on heavier more durable stocks as they will be carried, handed out, passed on and referred back to over a long period of time over all of which they must clearly convey your contact information. Business cards are often the first piece of print prospective clients/customers will receive from you; their stock and finishing selection is key in communicating brand values and creating positive first impressions. 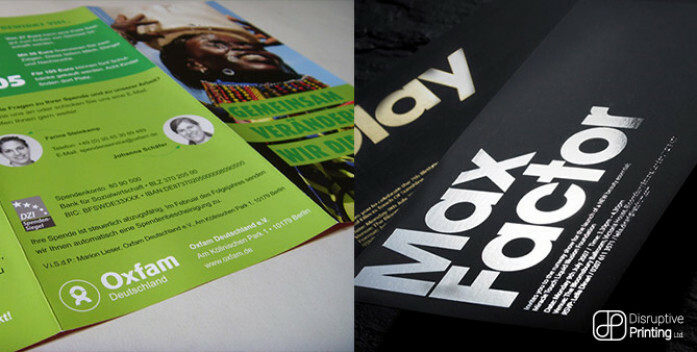 While it may be tempting to save money printing disposable items like flyers on lower density papers it is important to consider the message you are conveying and to match this with the paper stock –would you expect to receive an award ceremony invitation printed on 80gsm printer paper, probably not. We typically recommend glossy 250gsm flyers for most applications, the heavier stock and gloss finish both protect the print and ensure the flyer will not rip whilst conveying a message of quality. After you have selected the correct weight for your printed materials you must consider which finish is most appropriate. Paper stocks come as either coated or uncoated. Coated paper is treated such that it has a glossy or matte finish and gives the perception of a more expensive print job, whereas uncoated paper has an unreflective surface more suitable to everyday printing. Additional finishes are available on top of this such as gloss and matte laminate or foil stamping. For more information of different print finishes click here. Finish selection is subject to specific jobs; remember the glossy charity flyer? Some stock, finish and job combinations simply wont work together and at best will create the wrong impression on the viewer. For more information about stock selection for an upcoming print order please call today – 0113 323 1916, or email easy@disruptive-printing.co.uk.